Weed killer, it’s what’s for breakfast! 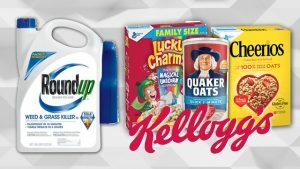 Environmental Working Group finds glyphosate in almost all conventional oat products, and some organic ones. The Environmental Working Group found glyphosateUpload Files in almost 43 of 45 conventional oat products and 5 of 16 organic oat products it tested, including popular children’s cereals, oatmeal and granola bars. Glyphosate, the active ingredient in Monsanto’s Roundup weedkiller, is classified as a “probable carcinogen” by the World Health Organization, a “known carcinogen” by the State of California. While Roundup has traditionally been associated with genetically engineered crops like corn and soy, non GE crops like wheat, oats, barley and beans are increasingly being drenched in the herbicide in a secretive practice that enables farmers to harvest them sooner. The EWG scientists consider foods with glyphosate levels higher than 160 parts per billion unsafe. One sample of Quaker Oats contained 1300 parts per billion. The EWG claims the American government has known these foods contain unsafe levels of glyphosate for years, but has been keeping it secret. “In April, internal emails obtained by the nonprofit US Right to Know revealed that the Food and Drug Administration has been testing food for glyphosate for two years and has found “a fair amount,” but the FDA has not released its findings,” the press release says. This would be a much better article if there wasn’t a link to shop related products that you just stated we’re contaminated with pesticides. Herbicide. And perhaps to show you which products? A picture may have been a better choice though. That’s a Google thing. I know what you’re saying, but not something the blog owner can control. Hahahah, that’s too funny. But the adds are not specific to the blog. My adds are for bank loans. It’s a way to confuse the consumer. These companies are well aware of the potential for loss,.. paying big $ to post their product amidst the harmful information drawing your attention to a products dangers…. Be sharp. Read the article and skip the commercial. Make your choice based on the initial reason for purposefully clicking the article. What drew you? Same as television or radio. You did not turn it on to watch or listen to commercials. You arrived at an article or show by selecting a subject of interest. You said that much better than I would have. But I would’ve tried to say the same thing. tracking cookies keep up with your search and purchase history. Just wondering about Canadian brands? Monsanto is in Canada, you decide. so, I have both in my cupboard. Is there any compensation for these products? How do you find out about bulk oatmeal? COSTCO gives $ back if you bought item(s) there. What about Aldi’s…. Millville oatmeal? I do think pesticides do not have a place in our farm fields. Maybe we’ll have to go back to the old days, where farms were only a few hundred acres or less, but not thousands of acres. That said, working around the forest industry, pesticides do have a place in forests, marshes, native grass fields, etc. Our natural beauty will be lost to invasive species if we can’t spray them. Sarah, that is utterly stupid. Where do you think the build up of pesticides in the forests ends up eventually? Nothing goes away so politely and conveniently just because we hope it will. Spraying the forest has so many negative consequences and what about the people going out into the forest to forage food that they think is ‘natural,’ yet is covered in this crap. Herbs, mushrooms, tree bark, animals that eat all that as well like deer and elk. Not all food comes from a farm. The invasive species are a problem, I agree, but often they are also a reliable food source and by harvesting them there is a better chance for an organic control than spraying. just curious here, but for the bottom Organic list, How can they claim it as organic if pesticides are used? Whenever I see information such as this, I wonder what the farmers themselves have in their pantries. Do they eat their own produce, glyphosate and all?